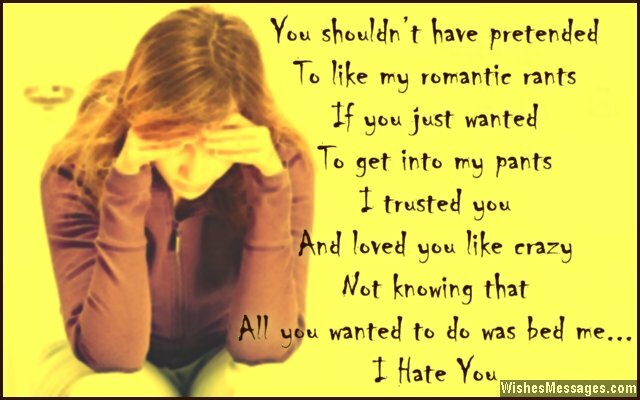 I hate you messages for ex-boyfriend: This post is a place where you can reflect on your breakup. You will be able to relate to the pain of a broken heart if you have been dumped, betrayed or cheated on. Without taking any names, you might be able to channel your feelings in a text, tweet or a Facebook update to express the heartbreak that you are going through. Subtly let your ex know how big a mistake he has made by betraying and cheating on your love. He should realize that he has lined himself up to be screwed over by karma. Whether it is a nasty quote or an angry rant – reading your message should push him into a pool of regret and remorse. 1) My hate for you is undying and it will never pause, just like how my love for you once was. I hate you. 2) I never knew that I was giving my warm hugs to a cold heart like yours, and my soft kisses to a hard soul like yours. But now I know the only thing worth remembering – that I hate you. 3) I never imagined that your voice, which was once music to my ears, would one day be the knife in my heart. I hate you. 4) All this while I thought that there could be nothing greater than my heart’s capacity to love you. But I was wrong because after we broke up I have realized that my heart’s capacity to hate you is much more. I hate you. 5) I am drowning in a pool of misery but I’d rather die than be saved by you. I hate you. 6) I hope you feel better, now that you have betrayed my trust. I hope your wicked heart rots alone, gathering dust and rust. I hate you boy. 7) I always thought that we both made a cute couple – just like two fish in a bowl. I just didn’t know that your name was SELFish. I hate guys like you. 8) Our breakup is bitter-sweet. Bitter because you broke my heart and humiliated my love. Sweet because I’d glad I found out your cheating ways sooner rather than later. I hate you. 9) While I got slashed from my very core, you were getting ready to soar. While you left through the door, I was down and out on the floor. I hate you. 10) I gave you my heart to love it, not crush it. I gave you my body to embrace it, not to humiliate it. I gave you my soul to cherish it, not kill it. I hate you. 11) If you wanted to be with someone else, why did you come into my destiny. If you didn’t know the meaning of love, why did you say I Love You to me. I hate you. 12) Moving on from a loser like you is going to be easy but healing the scars of being betrayed by you is going to be difficult. I hate you. 13) If you didn’t think twice before getting into another woman’s sack, why should I even bother taking you back? I hate you for being so ruthless and heartless. 14) Why did you have to make things so complicated by cheating on me? Had you told me from the beginning, I would have let you go easily. I hate you for lying all this time and breaking my heart so brutally. 15) I regret the fact that I exposed a love as pure as mine, to a heart as dirty as yours. I hate you. 16) Our breakup took me by surprise, it brought tears to my eyes. You have left me speechless, you have robbed my happiness. While I salvage my heart together, I hope yours rots forever. I hate you. 17) Don’t ever think that you will be able to ask for my forgiveness. That’s because the pain you have caused me has made me completely numb and heartless. I hate you so much. 18) I hope that every single tear that drops from my cheeks becomes the karma that comes around and crushes your happiness again and again. I hate you. 19) My feelings and my life, you have completely mocked. In agony and pain, I hope that your heart is forever locked. This text message is to let you know, that I hate you a lot. 20) I will get over my heartbreak soon but I will never stop wishing the worst for you. I hate you. 21) Even though you broke my heart and left me in a painful blur, I hope no one does the same to you. Because unlike you, I am not a monster. I hate you. 22) I hate you so much that I don’t just want to forget our relationship, I even want to forget your ugly face and your stupid name. 23) The void you have left in my life would rather be empty than be filled with thoughts of a spineless creature like you. I hate you. 24) You didn’t accidentally ask a girl out, so don’t say that you made a mistake. You didn’t accidentally sleep with her, so don’t say that you made a mistake. I loved you and trusted you, so I was the one who made a mistake. I hate you. 25) My heart is pink – bubbly, innocent, alive and throbbing with love. Yours is black – deceiving, manipulative, unreliable and full of evil. I hate you. 26) The only reason I will forget your mistakes is because I don’t want to clutter my mind with rubbish. I wish there was a big dumpster where girls could dump lousy ex-boyfriends like you. 27) No matter where I am, what I am doing or how old I become – I will always hate you for breaking my heart and hurting my feelings. I hate you. 28) Hate is a very small word to describe how I feel about you now, that you have broke my heart. I won’t even care explaining it because I want you to understand when someone does the same thing to you. I hate you. 29) Even though you have hurt me, you will always stay in my heart. First, I loved you from the bottom of my heart and now I hate you from the bottom of my heart. 30) Because you walked AWAY from me, I hope that someday someone walks all OVER you. I hate you. 31) You shouldn’t have pretended to like my romantic rants, if you just wanted to get into my pants. I trusted you and loved you like crazy, not knowing that all you wanted to do was bed me. I hate you. 32) To me, our relationship was like a bag in which I stored all my emotions, feelings and trust to share with you. Little did I know that you would make this your punching bag. I hate you. 33) All this while I lived for your happiness, now I will live for my own. I hope karma makes you suffer, for the betrayal you have shown. I hate you. 34) You should get an Academy award for being the best male actor of the year. Not once did I realize that you were cheating on me. I hate you. 35) The dreadful part is not that you cheated on me while you were my boyfriend. The dreadful part is what more you would have done had I not caught you. I hate you. 36) You pushed me into an ocean of despair – I hope you don’t get even a single drop of happiness in your life. I hate you. 37) I am at peace with watching you walk away. Now I am ready to live out brighter days. For how you have crushed my life, I hope your journey is full of strife. I hate you. 38) I wish I could go back in time and replace the word Love with Hate in all the ‘I Love You’ text messages I have sent you in the past. I hate you. 39) If you never tried to stop cheating on me, why should I even try to start forgiving you? No matter what you say or what you do, I will never stop hating you. 40) I wish I could break your bones in return of your actions that broke my heart. But I won’t because even that would not make us even. I hate you so much.